The compact and versatile Leica DISTO E7300 has multiple functions and is easy to use. Addition, subtraction, area, and volume calculations are achieved with the touch of a button while the last 10 results are stored in memory. 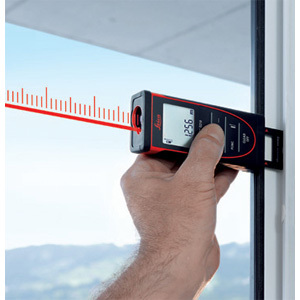 For everything you need to be accurate - the Leica DISTO E7300 measures with an accuracy of 1mm or better than 1/16". Thanks to its ergonomic and compact design with soft grip, the Leica DISTO E7300 sits securely in your hand, is lightweight, and fits into any pocket. Whether measuring out of corners, slots, or from edges, with this end-piece you are prepared for all measuring situations. The instrument detects the end-piece automatically, which helps you avoid expensive measuring errors. The results are shown on the three line illuminated display and can be clearly seen in all ighting conditions.